I bet you’re sick of me talking about how good Krypton is? I’m sorry, but it is getting better each week. It really keeps you guessing, which is what I love. When I watch a programme I always make assumptions as to what is going to happen, and so far I’ve been wrong about everything. 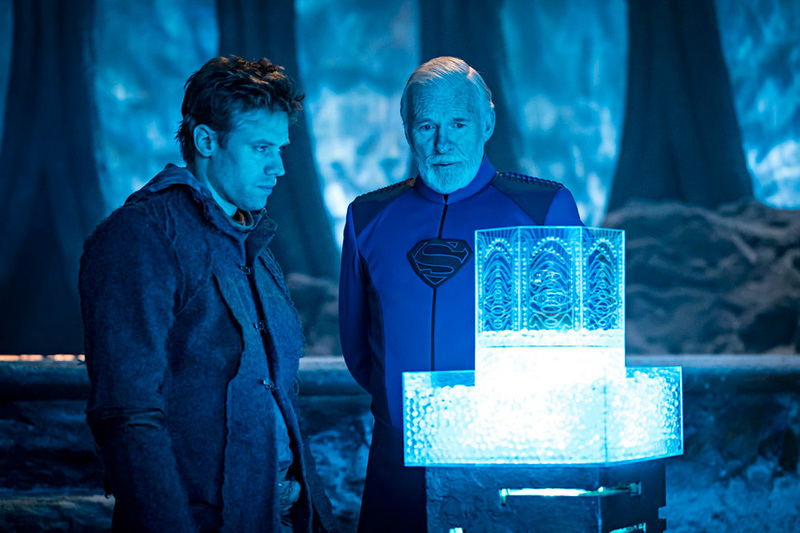 This episode really brings the whole series together, and it is clear that it is the turning point for Krypton. Lyta, Seg and Zod seek cover, as they learn about the failed coup against Rao, who was involved and why. We also see the creation of two small army’s, one to take down the threat to Krypton and the other to protect it. Relationships are put to the test as conflicting members clash to take down Brainiac, who is stronger than ever. As if Rao wasn’t scary enough, he is now taken by Brainiac and his voice just got a whole lot creepier! Although he can still hide behind the mask, Rao is no longer there. Although some try to reveal his true monstrous side, he wins over the people, including Daron Vex by feeding them lies. He claims to ‘save’ Krypton, but we all know what his real plan is here. Well you will if you know about the bottled city of Kandor. Again, the character development is incredible, each one shows their true colours in this episode. Daron Vex betrays his own daughter to save his own life and in turn Krypton. To be honest, I kind of saw that one coming, and I am sure she would have done exactly the same thing. It seems to be a trait of their house. However, Nyssa is slowly moving away from that, and in this episode we see her good traits – loyalty and honour. Not to mention she risks her life to save another. Although she is a hard nut, she shows a softer side to Seg sealed with a kiss, but her reason behind it is blurred due to the situation they were in. Relationships are really tested in this episode. It seems that each character has their own complicated relationships with one another, and it only gets worse from there. Lyta has a choice to make between friendship and family, whilst Seg risks his life to save Nyssa’s. This creates an odd dynamic between the three as they finally come face to face to save Krypton. Although Val-El is dead, he plays a huge part in this episode as he pep talks Adam Strange. The scenes of Val-El and his encouragement really remind me of Jor-El in Man of Steel. Always there when he is needed with words of Wisdom. It is clear where Superman gets his morality and compassion from. Adam’s character however, has really changed, he’s gone from being hopeful to doubting himself, and to them he has become a bit of a villain. He does however make reference to the Justice League, so it is clear that they exist within this universe. Not to mention, his plan was to go back to Earth and return to Krypton with someone who has a nickname – who could that be? With regards to costumes, I have to say Nyssa is killing it. No matter what her situation is, and it does take a turn for the worse at one point in this episode – she always looks incredible. Her costumes are fierce, and her posture really conveys that, she is a clear independent woman who can look after herself and it’s important to have that reputation. I also love Rao’s costume, still – it hasn’t changed, but that gold detail is just incredible. The effects and set designs are film worthy. We see Rao become a ball of flames as he attends the Nova Cycle, and it looks awesome! You really wouldn’t think it was a TV programme, they must have had one hell of a budget! And the sets are stunning, even though we have seen some of them a few times already they still impress me. Especially The Fortress of Solitude, each time it’s shown we see more and more detail. It’s fantastic. My favourite line of this episode? “You’ll wish the genesis chamber never spat you out”. What a great Kryptonian twist on a classic insult. Can’t wait a week? Check out the trailer for the next episode here.